Thanks to Gary A. Littlefield, R.W. Grand Historian of the Grand Lodge of Connecticut for the nice mention of Freemasons For Dummies in his April 2006 message. Alice and I flew Franceward this week for research on a new book, and to meet with with French co-author of La Franc-Maconnerie Pour Les Nuls, Philippe Benhamou. Also joining us were Philalethes Society members Mike Segall and his charming wife Odette, Michel Singer, and Brother Z. My thanks to all for a wonderful evening. Especially to Mike and Odette for recommending the great venue, Le Petit Chatelet, right across from Notre Dame Cathedral, and to Z for acting as chauffeur. Everyone has made this an especially memorable trip. Between Brother Z's career, Mike and Odette's incredible lives, Michel's globe-trotting adventures, and Philippe's work in the French space program, I definitely felt like the resident, well, dummy. The food was great, the conversation and company was even better. I continue to be be astonished and humbled at the incredible reception Freemasons For Dummies has received. This past week, I spent two days in Minneapolis, at the Grand Lodge of Minnesota's annual communication. The book and its Dummy have been awarded the Duane E. Anderson Award for Excellence In Masonic Education by the Masons of Minnesota. I don't know where to begin with how honored I am to be given an educational award for a book with Dummies in the title. More important, the reception I was given was nothing short of astonishing. If there are any Minnesota Masons lurking here, thank you, truly, from the bottom of my heart. Their Grand Secretary told me to prepare not one, but THREE presentations for Friday. I figured by the banquet Friday night, the rotten vegetables would be flying at me. But every session was a true delight. I owe a tremendous and un-repayable amount of thanks to MWBro. Andy Rice, the immediate PGM, MWBro. Neil "Cinosam" Neddermeyer PGM (and his wife Julie), Ed "More Light" Halpaus, Grand Lodge Education Officer, MWBro. Terry Tilton PGM, Grand Secretary Doug Campbell, especially SGD Tom Hendricks, and way too many others to list here. But most especially the brethren of Minnesota. 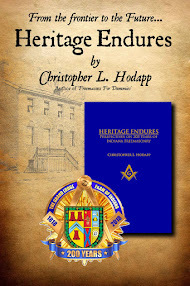 The Grand Lodge Masonic Book Program has delivered over 1000 copies to its members, and the Grand Lodge Book Store sold over 200 copies on Thursday and Friday alone. You guys won't ever know how that makes me feel, and I can't put it into words. Now, here's the really important bit. If you noticed something about the above descriptions, you'll see something very different from most Masonic jurisdictions. The GLofM gives a local and national award for excellence in Masonic Education. Their Grand Lodge meeting has three sets of afternoon breakout sessions on a wide variety of educational topics. They have a Grand Lodge Education Officer, Ed Halpaus, who emails a monthly educational piece to thousands of Masons. Ditto for Neil Neddermeyer, their Grand Lodge Fraternal Relations Officer, whose job it is to visit EVERY SINGLE LODGE IN MINNESOTA over the course of the year. He sends out CINOSAM, a weekly educational and anecdotal newsletter to over 3000 Masons the world over. Minnesota has a regular book program. In short, the GLofM has made a huge, ongoing commitment to educating its members. Their website is loaded with rafts of educational programs for officers and members. They believe strongly in the regular, ongoing mission of keeping their Craft educated, engaged and informed. That's a lesson we should all be stealing and claiming as our own. By the way, they have been planning for months a high-profile reaction to the upcoming DaVinci Code movie, and are planning for the onslaught of interest in Freemasonry when Dan Brown's Solomon Key is released, probably around Christmas. 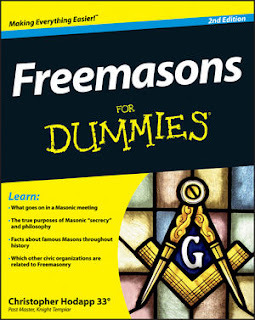 The French edition of Freemasons For Dummies, entitles La Franc-Maconnerie Pour Les Nuls has been available now for just over four weeks. I have spoken with the French Co_autohor, Philippe Benhamou, who tells me it has sold 6700 copies in the first month of publication! Brother Benhamou is a member of a lodge in Versailles. As I mentioned in the book,the notion of Masonic recognition is a sticky one, especially in the US where such issues can be hotly debated. Philippe's lodge is under the jurisdiction of the Grande Loge de France, the 2nd largest Grand Lodge in the country. Unfortunately, all mainstream US Grand Lodges recognize the Grande Loge Nationale Française - which is smaller in terms of membership. The upshot of this seemingly arcane discussion is that I can not sit in the same lodge with the co-author of my own book. And if that isn't madness, I don't know what is.